So you’ve thought about starting your own herb garden and that is a great idea! Now you have to figure out where to start. Where would you put it, what herbs would you grow, and what type of garden would best suit your personal taste? Don’t worry, we can help! Many herbs have beautiful flowers, and the scents, oh my, let’s just say nothing smells better than a well designed garden. Among these pages you will find an amazing resource of tips and techniques for starting your own herb garden. 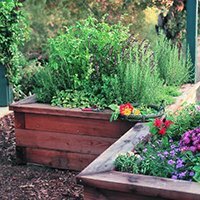 Many people prefer to keep their herb garden designs close by, not to mention the convenience of having fresh, home-grown herbs close to the kitchen when cooking your favorite meal. Whether cooking is your motivation for starting herb gardens or not, below you will find endless ideas and uses of the many herbs you might find in kitchens around the world. Chia Seeds: Chia seeds have become a health food craze! Rich in omega 3 fatty acids, these little seeds have been nicknamed the superfood by many renowned nutritionists around the country. Chia will make an excellent addition to all herb gardens, and you can't beat the health benefits. Ch-Ch-Ch Chia! A great gift for that hard to buy for person, Chia Pets are terra cotta pots shaped like various animals that sprout Chia to look like fur! These are a great novelty item to add to any windowsill to bring a little bit of life to your kitchen. Cooking with Herbs: Who doesn’t like to add a little spice or flavor to their favorite foods? Browse this section to find out how cooking with herbs can be improve your favorite dish. When you need to spice up your cooking, using fresh culinary herbs will add the flavor and taste you are looking for. Start your own herb garden designs on the windowsill in your kitchen or outside on your patio. Either way you will always have what you need on hand! Drying Herbs: Do you have too many herbs that you don’t know what to do with, drying herbs is a great way to preserve your herbs and keep them the freshest. Check out the best ways for drying herbs and storing. Easy To Grow Herbs: Alot of people are looking for easy to grow herbs to use in their kitchens, or to grow in their herb garden designs, but many don't know where to begin. Here we offer some practical, common sense guidelines to help you get started. Some are obvious, others you may not have considered before, but all of them should help get your herbs off on the right leaf! Plant Labels: Ever start planting your garden and can’t remember what seeds you have started in what container? Plant labels are a great investment, as they will ensure you aren’t planting tall flowers in front of smaller flowers and that you have your plants exactly as you want! Garden Stakes: Great for tomato plants or those tall plants that you need a way of keeping standing tall! Garden stakes are cost efficient and a great way to keep your herb garden designs looking great. 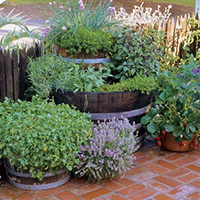 Growing Fresh Herbs: Growing fresh herbs is a great hobby for both the young, and the young at heart! 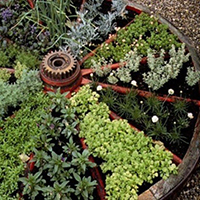 Not only is it relaxing and enjoyable, but herb gardens are useful in so many ways. Herbs can be used for so many different varieties of cooking, some herbs can be used for medicinal purposes and others are just, well, beautiful to add to any garden. Herbalism: Herbalism, also referred to as Herbology, is the study of the uses of plants for medicinal purposes. Since prehistoric times, people all over the world, across every continent, have used indigenous plants as a treatment for ailments. Learn more information about this fascinating science. Herbal Medicine: Feeling under the weather? Nothing beats a cup of Herbal Tea to soothe your throat or clear your head. Many herbs have been claimed useful for decades for a wide range of health benefits. Many however have been known to cause health problems, while others are simply not effective and may interact with other medicines you may be taking. Look for helpful tips before trying an herbal medicine you are not familiar with. Herbal Remedies: For centuries herbal remedies have been used to treat disease and illnesses. Still a popular alternative in the Far East and China, herbal remedies can be obtained from a broad range of resources including plants, trees, roots, and flowers. Many herbal remedies were the precursor to modern medicine. 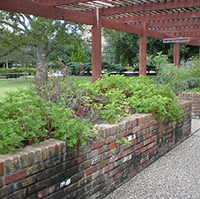 Look up common uses and information for herb gardens, and the ailments they have been used for. How To Dry Herbs: Learning how to dry herbs is a fantastic way to preserve your freshly grown herb plants for use over the cold winter months. There are tips and techniques that you can learn and become a pro at the process in no time. You've taken great care in creating herb gardens that are yours, why let the bounty of your work wither and die with the freezing temperatures? Learn how to dry herbs today! Hydroponic Herbs: Many of your common, every day use herbs can be grown through use of Hydroponics. Hydroponic Herbs give you the freedom to grow your herbs just about anywhere, without some of the annoyances you may experience in outdoor gardening, such as dirt, weeds, pain in your knees, etc. Hydroponic herb gardens can be an excellent hobby for any age level. Indoor Herb Garden Designs: When you just don’t have the space for an outdoor garden or aren’t a fan of the outdoors, but want the luxuries of a garden, planting Indoor Herbs is the way to go. Pick your favorite windowsill or sunny area and start your own little Indoor herb garden. Medicinal Herbs: Medicinal herbs are a growing trend in the United States, and many people have grown to prefer them over modern medicines. Medicinal Herbs, including aloe, dill, and chamomile, to name a few, are a great way for that natural cure for some of your everyday aches and ailments. When coming up with herb gardens for medicinal purposes, always make sure to consult your doctor. Mexican Herbs: For the authentic Mexican dish, Mexican Herbs are a key ingredient. Check out this section for a list of different herbs that you can use and how to use them. Mexican cuisine is becoming increasingly popular around the world, and so are the herbs and spices that go into them. Look inside for great ideas and additions to your herb garden! Organic Herbs: With today’s ever growing desire to eat all-natural, chemical-free foods, organic herb gardens will help you keep your meals fresh and natural, without all those harmful pesticides. Organic herbs can be costly to buy at your local grocery store, so why not try your green thumb at growing them in your own garden? Potted Herbs: The versatility of potted herb garden designs is a great draw to a lot of people. 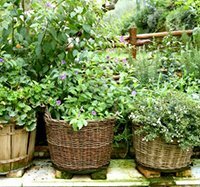 You can place potted herbs on your porch, in your garden for decorative purposes, on your deck, or even in your windowsill. The possibilities are endless. Urban Homesteading: Urban homesteading is the act of turning your suburban or city home into a self-sufficient property that is capable of meeting some or all of the food requirements of its residents. You can start off just by building your own vegetable and herb gardens. More than that however, it is also about reducing your impact on the environment and the world around you. Read further for some great information!